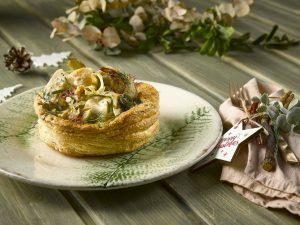 The lightness of the vol-au-vent is perfect for this Christmas recipe made with Corvina REX. Fish – juts as seafood – is one of the main ingredients of the dishes that shine in impeccable tables these days. Thus, this year’s recipe proposal to delight friends and family, perfectly combines all the above. The delicate Corvina REX, along with tasty clams, cooked with fish broth and white wine and accompanied by the vegetable touch of onion and artichoke. All this inside a fine vol-au-vent and with a very original decoration based on parsnips, hydrated algae and dill. Marie Antoine Carême, also known as Antonin Carême, is the creator of this pastry piece that is usually filled with some exquisite salty mixture. Inspired by this French gourmet, chef and architect and with the suggestive Corvina REX, we offer you our Chef’s version (See recipe). Carême started at age 16 as an apprentice in one of the best Parisian patisseries and, throughout his long and intense culinary career, he was at the service of the Russian czar Alexander I and he also was head chef for the Prince of Wales, George IV, among many other personalities. No such curriculum is necessary to prepare our recipe, being a “Sailor” is more than enough.